I have to confess to knowing very little about this play and the story which inspired it so the student in me took to the internet to learn more after watching. As I expected, the interactions between the two men have been highly fictionalised (or to borrow the terrific portmanteau used by the director, Clare Britton, ‘factionalised’) for dramatic purposes but, as is often the case with these interpretations, their roots are based in some semblance of truth or rumour of the time. Peter Shaffer’s play is an engaging version of events told from the point of view of an elderly Antonio Salieri, who immediately captivates the audience in his retelling of the story of his interactions with Mozart back in the 1780s and in quoting his title, The Death of Mozart. Or did I do it? As far as catchy titles go, it’s right up there with Dr Strangelove or: How I Learned to Stop Worrying and Love the Bomb. As with the latter production though, I was gripped by Amadeus from the beginning. It’s worth mentioning from the off that John Myhill as Salieri was fantastic casting. When he shrugs off the housecoat of the older gentleman, he transports us to the courts of Vienna, transforming into the dashingly self-assured darling of the Habsburg Monarchy. The apparently broken old man tormented by aural hallucinations is instantly forgotten as we see Salieri meet the much-discussed Wolfgang Amadeus Mozart. And what an entrance Mozart makes. Gary Amos plays the young genius brilliantly with such a high-pitched, shrieking intensity that I quickly understood why Salieri might have murdered him. Amos’s Mozart was brought to life with a huge amount of energy and towards the end with genuine pathos. His eventual mental and physical decline was difficult to watch and I felt sincere sympathy for him, especially as he was mostly ignorant to the role of Salieri as the puppet master behind his undoing. The casting of the female roles in Amadeus is worthy of note: particularly Alex Rex as Mozart’s long suffering wife, Constanze. The scene which shows her larking around on the floor with a hyperactive Mozart under the cynical stare of the crema di mascarpone-munching Salieri was a joy. It’s not all fun of course. 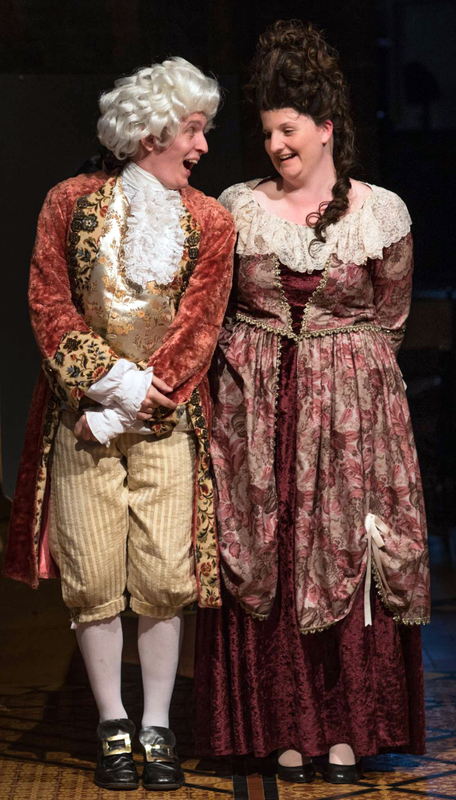 She endures his extra-marital affairs and lack of provision for their family with stoicism and self-sacrifice; Alex’s performance shows effectively how Constanze grows up alongside the still child-like Mozart. Beverley Webster’s silent and statuesque Teresa Salieri sadly only appears briefly on stage but really was value for money; a withering look from Mrs S would be enough to reduce a grown man to tears. The other parts were played very well - I really liked the cast as the raucous audience during the perform-ance of Mozart’s The Magic Flute. 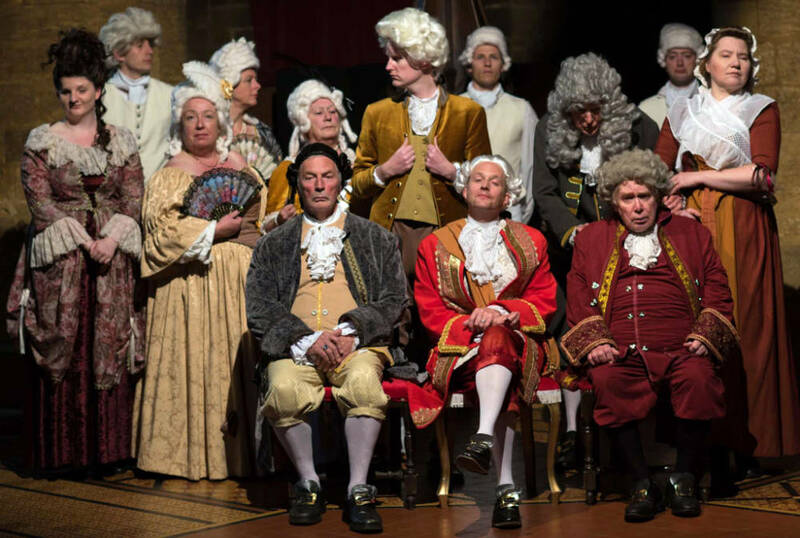 A special mention has to go to Mark Mortimer and Barry Dougall as the Venticelli (or ‘little winds’ as I recently found out), the gleeful bringers of news and gossip to Salieri and comic relief for the audience. It was well acted and directed, hugely reliant on the two main performances but both Myhill and Amos were more than capable of holding the audience’s attention and bringing the play’s themes of religion, near-Faustian pacts, professional jealously and the unreliable narrator to the fore. 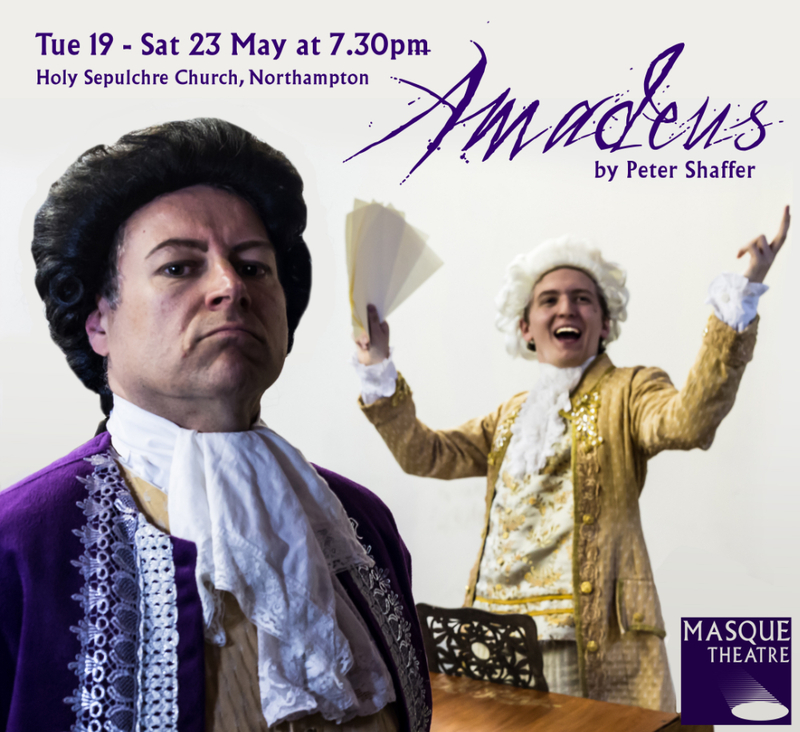 Amadeus by Peter Shaffer is a 'factional' account of the lives and interactions of two composers: Antonio Salieri and Wolfgang Amadeus Mozart, set in 1780s Austria. It originally premiered at the National Theatre in 1979 with Paul Schofield and Simon Callow playing the leads, and has been made into a popular film and has been performed in many countries. The play begins in Vienna in 1823. There are rumours spreading amongst the citizens of Vienna that the eldely Salieri has confessed to murdering Mozart. The play goes back in time to 1780s Vienna when Salieri was Court Composer to Hapsburg Emperor Joseph II. When he hears Mozart is coming to Vienna he is excited at the thought of meeting a composer who has been a musical prodigy since the age of four when he began performing all over Europe and also began composing symphonies,concertos and operas from the same age. With a middle name like 'Amadeus' (beloved by God) he obviously has a wonderful, God-given talent. But when Salieri meets Mozart he cannot reconcile his talent with his childish behaviour and foul language. The very devout Salieri renounces God and vows to bring about the destruction of his 'creation', Mozart.